About a year ago, I joined Slalom Consulting here in new York as what we call a Practice Area Lead. (As a minor aside to the point of this blog post, that change in jobs accounts for my total drop-off in blogging. It was a big change in roles and a big change in day to day “stuff” but I’ve sort of acclimated myself to it and look forward to writing again ). In this PAL role, I’m responsible to save the company and the immediate environs of 21 West 21st street from disaster on a regular basis. It’s a lot of pressure (more than you might think – just think of all the children!). In service to that imperative, I need to help out with pre-sales, create and update go-to-market offerings, hire good folks, train up folks to make them better (but really, to make my job easier) and occasionally do something billable at a client. I get a lot of “input” – questions from clients, sales opportunities, my own addled thoughts and so forth. Some of it’s really good (like a hot sales oppty) while a lot of it is less good. The key is to initially track, prioritize and manage each of these ideas (great and small) to a successful conclusion. This kind of task management isn’t new, right? And we have lots of task tools to help us with this. Outlook has tasks. You can slap a spreadsheet together nice and quick. My very first task management tool was a legal notepad back in my days at GAF as a developer in the IT department. (Ask me about those good old days the next time you see me if you’re interested, or maybe not…). Being a SharePoint guy (nominally, at least), I’ve always thought to use SharePoint. But for some reason, a generic Task list never quite did it for me. 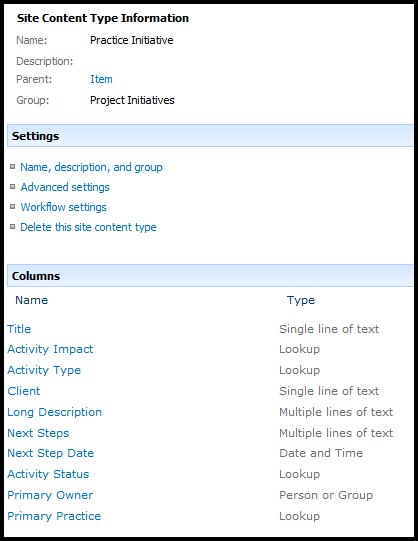 A bunch of months ago, I decided to heal myself and just create a SharePoint based solution. It was so embarrassingly easy to create that I thought to write about it here. “next step” driven – these activities will often span weeks (maybe even months). They almost never “end” after one specific update. You can actually see that I had a sales bias with this at first, since I have that “Client” field. A lot of my practice’s activities are based around clients (either actual or prospective). But many of them are also internally focused. I slap “Slalom” in there when I create them, but it always feels a tad weird. I should have named it something more generic. Maybe “Target Organization” or something. Activity Impact has devolved into a measurement of priority. I’m not sure why I went with “Impact” and not “Priority” day zero, but that’s what I did. Primary Owner – the only thing of note is – isn’t it awesome that you can sort and filter on multi-select columns in SP 2010! I actually didn’t fully buy into this notion at first. Primary Practice – After I began using this, another PAL in my group wanted to try this out, so I slipped this into the mix to distinguish between my stuff (Portals & Collaboration) and her stuff (Azure). (sorry for all the blurred out bits – I didn’t feel like creating a bunch of test data and I don’t want to give anyone a heart attack over sharing vital details [see the bit in the intro re: save the world, etc., etc., etc.]). I have several other views on this list, including a datasheet view that allows me to do mass updates. I do this most often when a bunch of lower priority items I planned to do a never quite got done and need to be pushed out a week. Every day, I pull up my activities log and just start working off the top of the list. In part 2, I’ll explain how I made this even more useful with the addition of a nice email-enabled doc library and SPD workflow. 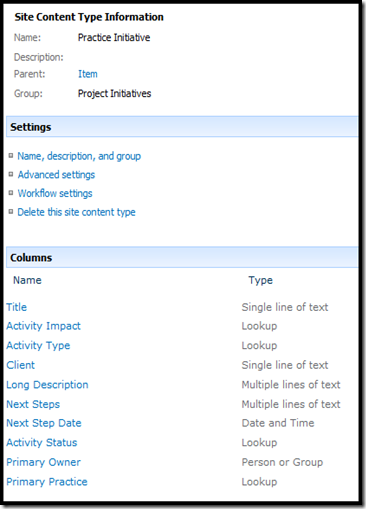 This entry was posted in SharePoint Solutions Design and tagged Solutions on November 19, 2012 by Paul Galvin.